Here is a look at the potential storm timeline for today. 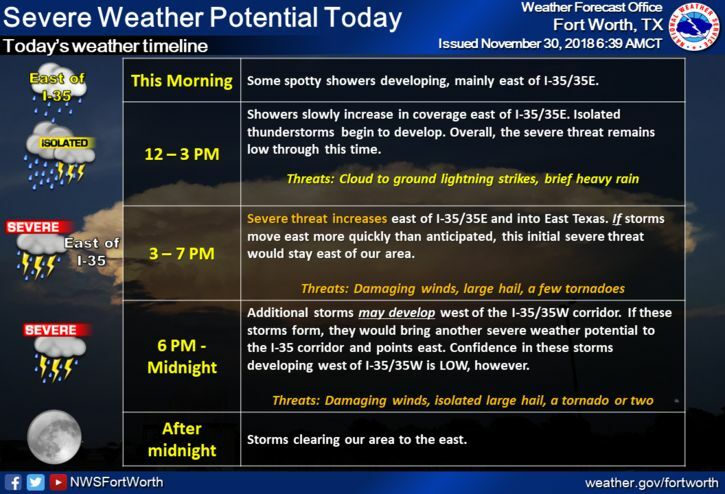 There is a severe threat is low this morning and into the early afternoon hours, but the severe threat will increase quickly later this afternoon and evening, initially east of I-35 with all modes of severe weather possible. Another area of storms may develop just west of I-35/35W early this evening, but this remains uncertain at this time. If these storms form, they would also have the potential to become severe with a threat for damaging winds, large hail, and an embedded tornado or two as they move quickly to the east.